Ok, in this post which lists my incomplete and quick jumble of apple tree vigor thoughts, I introduced the photo below. It shows the fall flush of late season growth (bright green), which I’ve decided to use as a visual indicator for vigor. Quickly, so you don’t have to go and read the last blog post, my theory is this: For a heavy soil that receives a lot of rain, slope matters when you’re planting very vigorous varieties (v^3) of apples. Vigor isn’t a good thing in my mind, at least not for apple production. The tremendous amount of vegetative growth this orchard gets makes the trees more susceptible to fireblight and reduces the fruiting potential. I want to learn how to better control vigor in order to more organically reduce pressure from fireblight and lack of fruit (there are antibiotics and black magic sprays that address these issues in a conventional orchard). Enter in this picture below: I know it’s a bad picture (I could really use a cool drone for this sort of thing), but you can see the green flush of the upper NE corner and how there is a lot more growth on those trees than the rest. 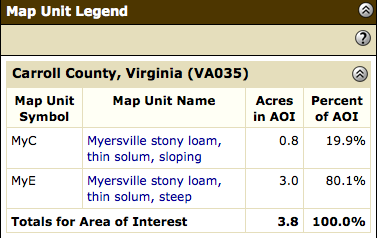 I decided to look at the web soil survey (through NRCS) this morning to see if the soil map complements my theory that slope and aspect (but mostly slope) do have an important effect on tree vigor. You see! The difference between a “sloping” loam and a “steep loam” is totally corroborated in the picture that I took. 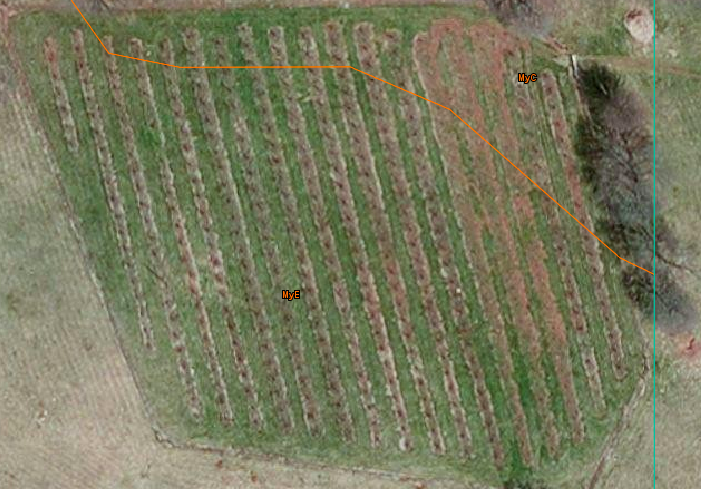 It seems like everyone in permaculture is on the “plant on contour,” “swale,” or “keyline” kick. I’m here to remind everyone that no site is the same. We have a rocky silty loam that is clay-rich after 7 inches down. We get a lot of rain. We have problems with too much vegetative growth and not enough fruit bud growth. Swaling, contour plantings and keyline are often seen as silver bullets for regenerative ag and in many circumstances, I agree. However, it’s time to think about the crops we want to grow and how to get fruit off of them. In Southwestern Virginia, trapping water would would cause INSANE vigor that would reduce our crop and increase susceptibility to disease. Of course, rootstock and variety selections matter as well, and I’m mostly talking about heirloom varieties here which tend to be more vigorous anyway. If you live in an area that has heavy soils, a decent amount of rain, and want to plant fruit trees…give slope and aspect a thought in terms of vigor. Steep slopes where water isn’t given an opportunity to slowly seep into the soil…might be worth the thought. One of the issues with steep slopes and subsoils that are clay or compacted is that there is a greater chance of topsoil erosion. What would your AOL remedy be? This is quite interesting as I had not thought about vigor in this manner. I’d love to share this with Permie peeps up here in the NE…with your permission.